When Peter Nicol asked me what I thought about the "interactive exhibition" I had just seen, I garbled something incoherent about "crowds getting involved" and "innovation". Five seconds later our promoter, VIP and resident Squash Legend was delivering a flawless live link-up for a regional news broadcast. I removed my fist from my mouth and pondered some more. Behind the court the sun set before the final of this year's Canary Wharf Classic. 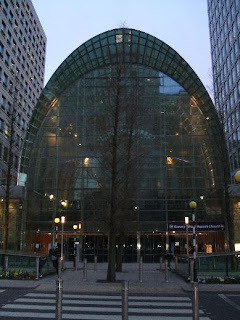 High above a last ray of light refracted through the huge glass arch of the East Wintergarden before receding into the dusk. I had jumped off the tube just in time to catch the technologically-enhanced warm-up for the sixth final of this tournament. I'm glad I did. 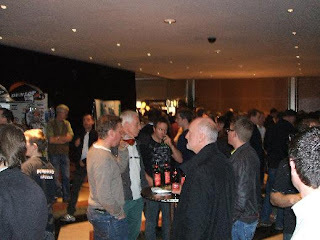 In the last tournament I wrote up I bemoaned the lack of crowd-pleasing interval entertainment. I've also written here before about the sport not taking enough risks with the technology that might be available to enhance it as a spectator sport. Tonight we had South African pro Stephen Coppinger and England's Peter Barker playing a short game wearing head mics, commenting on their game as they played. This was not the first time I had seen this done - see this great footage of cricketers Adam Gilchrist and Andrew Symonds commentating on a match during play. 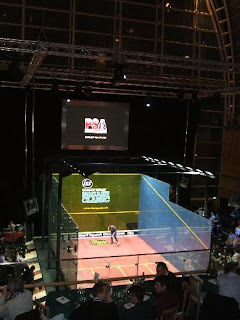 We can't expect squash players to comment on their games during competitive matches - but what other possibilities are there? They were also wired up to heart monitors which gave readouts on the large screen above the court and smaller ones facing sections of the crowd. Again, it probably wouldn't be wise to have this kind of information displayed at every match - but what other possibilities are there? The speed of each ball hit was displayed it in the front wall via a radar gun positioned somewhere around the court. The speed of squash is one if its main draws, and this kind of thing could (like in tennis) become a fixture. But what other possibilities are there? This technofest was accompanied by music played over the PA system throughout, with compere Alan Thatcher and official Linda Davie interacting with the players during play. They had lots of fun and so did the crowd. This 'interactive exhibition' was an experiment set up by the organisers, and it worked. But it suggested lots more than that. It showed how with a bit of innovation squash can broaden its appeal and reach new audiences. Each of these toys were portable; ideal for a game that has never marketed itself enough on one of its prime assets - its inherent portability. What will purists make of such bells and whistles (purists please comment below!)? To some extent the the argument in favour of modernising the sport by altering its format has been partly won. The change to PAR scoring in pro tournaments appears to have been vindicated (the men appear to have welcomed it, though too early to tell with WISPA events), even if the transition was handled in an all-too-familiar-to-squash administrative fog. The exhibition tonight suggested that modernisation of format could be (relatively cheaply) augmented with props designed to enhance spectators' experience. Though it was only an exhibition we were watching, possibilities for competitive play abounded. Let's hope we see some more of these experiments with technology at other venues soon - ideally with an IOC offical in the front row. So what might have been kept back for keeping people in their seats after an interval trip to the bar was put before the packed crowd from the off. During the twenty minutes or so before the final I had a scout round, taking in for the first time the great facilities and view from the VIP bar (see top photo). Down below Alan Thatcher bigged-up the 2016 vote, and the WSF will be pleased to note that the 2016 T-shirts seemed to be doing a decent trade at the stall. Those sitting the interval out courtside were watching the 2016 promo video on the big screens. I wasn't sure about this after seeing it online, but it worked well in the hall tonight with the soundtrack banging out combined with the atmosphere this venue seems to generate. A huge step up from previous efforts put together by governing bodies; if I were to point out one area for criticism it would be the graphics overlaying the footage, which appear something of an afterthought. So to the final. Sitting back down I overheard a couple of newbies describe the Barker v Coppinger exhibition as "inspirational but humbling". It's a shame I didn't ask their opinion an hour later, after another final of the highest quality, albeit not a five-gamer as in each of the previous years. I've written here before about the strength of competition at the top of the men's game. The sport itself may still be lurking in the shadow of it 1980s heyday, but the past decade may be looked back on fondly in years to come as something of a golden age. After years of dominance by a handful of players, literally anyone on world top ten ladder was in with a decent shout at tour events. At the end of this match David Palmer would talk about deferring retirement for as long as his body would stand up to it. If he could be given a bye straight to the final of a PSA tounrnament, he'd still be the odds-on favourite when he's 50. Few are more feared once a trophy is waiting on the baize than Palmer. Whatever the players might feel about their own form during a tournament, or however many five game matches either finalist has played, few are so demonstrably up for it than Palmer when the silverware's in reach. Like when a terrified Frank Bruno crumbled after making the mistake of eyeballing Iron Mike, Palmer's opponents in all those finals were half-beaten during the knock-up. Though the temper that sprung out earlier in his career is now tamed with the natural self-assurance that comes with being in your early thirties, that extra steel is never far from hand. Few can enjoy playing him. That is why 2 World crowns and 4 British Opens (count 'em) are locked in the cabinet. To coin Shane Warne's phrase, he 'backs himself'. And then some. It would be interesting to look up the percentage of times he has won when in a final. When he gets there, the outcome is rarely in doubt. If I were to pick a defining moment to illustrate this it would be the 2002 World Open final against John White in Antwerp. 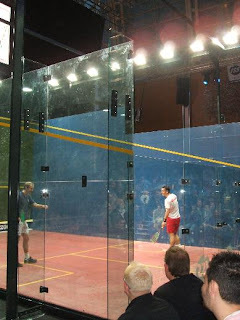 Match point down in the fourth, Palmer was moments away from losing the first World championship to be held for three years (there was no World Open for the men in 2000 and 2001 due to lack of sponsorship). White had match ball at 14-13, which Palmer saved. At 14 all White called 'set one', but tinned to allow his opponent back in and take the game. 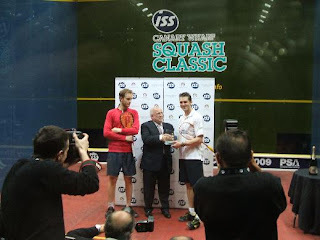 Palmer took the first of his World titles 13-15, 12-15, 15-6, 15-14, 15-11. Much has been written about that final. In hindsight (that handy tool for crafting a a good story while sanding off inconvenient burrs of reality) - and with White retired - it is easy to borrow the sportswriter's cliché about triumph of the cold professional over the nice guy. But there is some truth in it. White will always have more fans, but Palmer has the trophies. So seeing Palmer clearly deep in the 'zone', stretching in the foyer 15 minutes prior to coming on court tonight indicated that James Willstrop was not going to catch the Aussie on an off day. Right: A compilation of first round action from the tournament. Willstrop had come in to the final after two hard fought five-game matches, including a recovery from two games down to the rapidly improving Spaniard Borja Golan in the quarters. Coupled with the illness and injury that had troubled him this year it was testament to his competitive instincts and commitment to this tournament (he had won it three times previous) that he managed to question Palmer's nerve after coming back from 2-0 down to take the third. The Australian dominated the first two games, throwing textbook shapes with his metallic orange 'bling racket' (as described on the BBC 606 website) down the backhand wall, to dictate rallies through an imperious length. The 11/9, 12/10 scoreline half way through the match on paper doesn't do justice to Palmer's command of the court, with Willstrop rarely picking up points by design. A number of balls were hit out of court, while a few more appeared to die prematurely in the front-right court - both players appeared to be miffed slightly by the behaviour of the ball on the court tonight. At 6-1 down in the third, Palmer had more than one hand on his opponent's title. As he had done all week, Willstrop dug in for a final heave. The crucial moment was at 3-6, when Willstrop hit a loose ball off the wall into mid court. Palmer double-pumped his bling-laden right hand to kill the soft ball, only to fire it straight back at Willstrop on his shoulder. After finding himself out of position all night, and with split-second instinct, Willstrop stuck his hand out and intercepted. The ball was dead at the backwall before Palmer had time to turn round. Now the crowd really got behind 'Jimbo' who, given his efforts this week, would have been mortified if he were to have not taken a game here. Willstrop started to take more risks and his deceptive game started to reap some reward. As Palmer appeared to be wilting, Willstrop seized the initiative to take the game 10-8. Both men were clearly exhausted by the fourth. A near mid court kill took Willstrop 2-1 up, but his renewed intention quickly waned as Palmer snuffed out his attacks with the superior efficiency of movement that he had exhibited all evening. At 6-6 Willstrop served out, clearly almost spent. 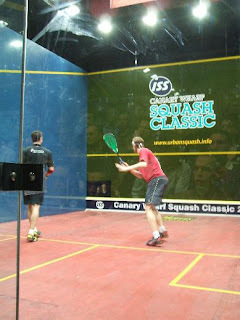 Palmer took hold of the ball and the Canary Wharf title 11/9, 12/10, 8/11, 11/7. 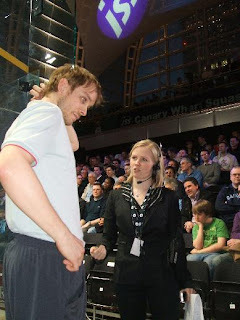 When asked about his performance after the game, Willstrop said that he was "pretty unhappy with it", which his body language suggested was a massive understatement. He gets great support here as he does in Manchester, and his success in this event over the years demonstrates that the venue brings out the best in his game. Those who were lucky enough to appreciate all of his efforts throughout the week would surely not agree with his self-criticism. This was evidently a big win for Palmer - "right up there with (his) best victories". He joked that he never gets to play in front of his home crowd, and that he played a mind game with himself where "every time he heard support for James he convinced himself that it was really support for him". Like Nicol plotting to take Commonwealth gold in 2006, or Power coming back one last time to occupy the world number one spot just before retiring, Palmer seemed bent on proving something to himself. He finished by telling Alan Thatcher that playing over the age of 30 was about "making adjustments with daily training ... trying to keep up". There are some young (and other not so young) players on the tour who'll hope he doesn't carry on till 50. "Had I just glimpsed squash's future ? ... "
Maybe ask Ross Triffit how much this company invested into our sport and what happened next? there must be the technology to trace the hitting speed.